Update: Senate Joins House In Passing Sandy Aid Bill : The Two-Way A second, larger chunk of aid for those devastated in the late October storm will be voted on later this month. There has been bipartisan outrage this week that the House had not acted sooner. Superstorm Sandy swept through the Breezy Point neighborhood of Queens, N.Y., in late October. In late November, this sign symbolized the hope of homeowners that help would be coming soon. The Senate just passed, by unanimous agreement, a bill that injects more than $9 billion into the insurance program that will assist those hit hard by Superstorm Sandy last October. President Obama had urged passage and is expected to quickly sign the bill. By an overwhelming, bipartisan majority, the House of Representatives on Friday passed legislation that puts more than $9 billion in the pipeline to pay flood insurance claims filed by those who were in the path of Superstorm Sandy when it swept over New Jersey, New York and surrounding states in late October. The legislation goes to the Senate, which is expected to give its OK later in the day. The House vote followed three days of bipartisan outrage and complaints about the decision by Republican leaders not to hold a vote on a larger, $60 billion, package of aid before the 112th Congress finished its business earlier this week. New Jersey Gov. Chris Christie (R) said that inaction was one more reason "why the American people hate Congress." After the uproar over the non-vote, Speaker John Boehner said the House would take up the aid in two pieces — the $9.7 billion tranche passed today and a $51 billion chunk to be voted on by Jan. 15. According to The Associated Press, "about 140,000 Sandy-related flood insurance claims have been filed, FEMA officials said, and there are about 115,000 pending claims. Many flood victims have only received partial payments on their claims. 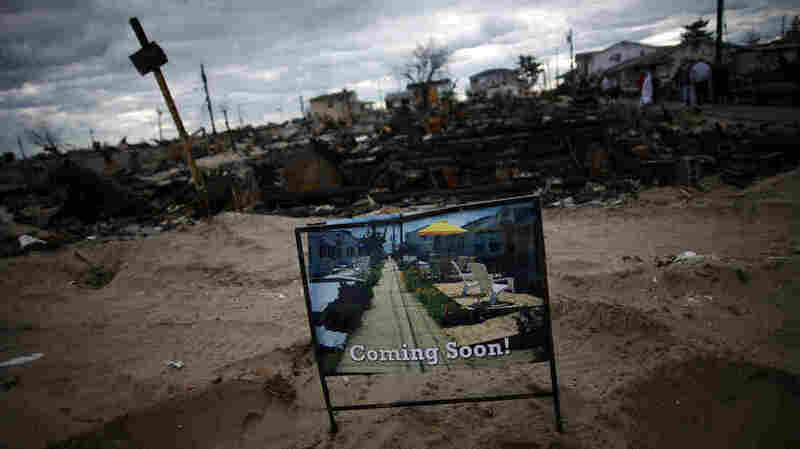 ... the most costly natural disaster since Hurricane Katrina in 2005 and was blamed for at least 120 deaths. Northeast lawmakers have complained that it took just 10 days for Congress to approve about $50 billion in aid for Katrina but that it hasn't provided aid for Sandy relief in more than two months."